The National Union of Somali Journalists (NUSOJ), Human Rights Journalists (HRJ), Somali Women Journalists Club (SOWJOC), Somali Media for Environment, Science, Health and Agriculture (SOMESHA) and Media for Peace extend warm greetings and good wishes to all members of the media fraternity of Somalia on the occasion of National Press Day on 21 January 2018. The five journalists’ organisations have seen the media in this country evolve from the repressed but guardedly resilient model of the oppressive political environment in order to be a robust and assertive force. The Constitution of Somalia guarantees freedom of the press but the practical environment tells a different story. This day’s celebration of the National Press Day takes place against a gloomy and tearful backdrop. Tragedy and grief have continued to visit the journalists’ community in the past one year. Four journalists were murdered, several were wounded, dozens were arrested and countless journalists were threatened and censored. Because of their sacrifices, media has sustained to play a pivotal role in shaping Somali society. Be it television, newspapers, website or radio, the consistent coverage by media on each and every issue of the society creates bigger impacts, making it one of most important professions of these days. From newspapers to radio and television, Somalis continue to witness tremendous growth in both investments and editorial output. Social media has also grown in leaps complimenting the inevitable space of freedom of information. NUSOJ, HRJ, SOWJOC SOMESHA and Media for Peace call upon the media houses to display highest standards of professionalism in their duties, and motivate every journalist to be more responsive, responsible and independent. Truthfully, the journalism ethos and editorial independence that define a significant segment of media have been vigorously shaken by present-day factors, notably commercialization of the media industry and manipulation from political powers. Some media houses and editors have abandoned professional ethics due to manipulation by politicians or corrupted by perpetrators of graft. 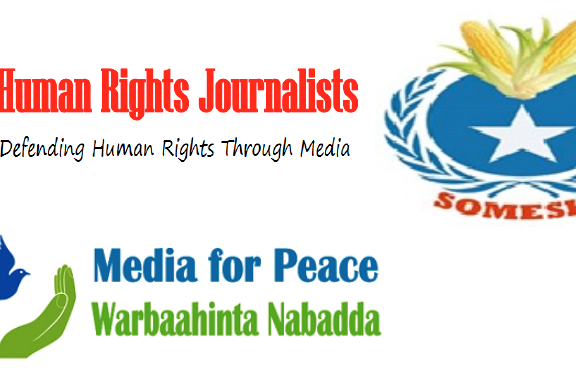 Journalists groups call on Somali government to withdraw monthly disbursements to several media houses in Mogadishu, and demand public officials to cease giving handouts or making special favours for media bosses to protect independence and professionalism of the media. Somali journalists must aggressively live up to their core mandate by speaking out for the innocent, defend the powerless, accuse the guilty, pillory the thieves and ask awkward questions, investigate, press, persist, excavate and discomfort. There shouldn’t be any political and corporate pressure on the media on individual journalist. We must protect and promote the credibility of the media industry by fighting for high standards of professionalism, integrity and dedication to facts, objectivity and fairness in execution of journalistic duties.